Today’s scales can do much more than just measuring how much you weigh. The best digital scales can now even let you know your BMI (body mass index) which measures your body fat in relation to your height. Better still, several of the best digital scales that measure fat come with apps you can download to your smartphone, which will let you track your progress easily over time, and, if your feeling brave enough, share it with friends. Whether you’re looking to slim down, bulk up or just keep track of your children’s weight and growth, this handy guide is here to help you find the best digital scale for you. Power supply – You can find body fat scales with different power supplies out there, so make sure you get the right one for you. Many of them will take batteries, such as AA, AAA, and lithium, while many of the newest scales are solar powered. If you do go for one with batteries, make sure it has an auto shut-off function to save power. Maximum weight – Smart Scales are also designed with a maximum weight capacity, so make sure you get one that is going to be enough for yourself and anyone else in your household who wants to use it. Accuracy – As you can expect, a good set of digital scales should be very accurate. While you’ll never find something that is 100% accurate 100% of the time, high-quality BMI scales can be accurate to within 1 pound over 95% of the time, while some of the cheaper ones may routinely overestimate by 6 to 10 pounds. While this might seem like very little, weight loss is a tough process, and every little bit of encouragement helps. Apps – As you may know, many digital scales come with apps that can be downloaded straight to your smartphone or tablet. These apps will store the results of each weigh in and help you track progress over periods of time. If you’re looking for one of these smart scales, better make sure you have an Android or iOS device that can run it before buying. 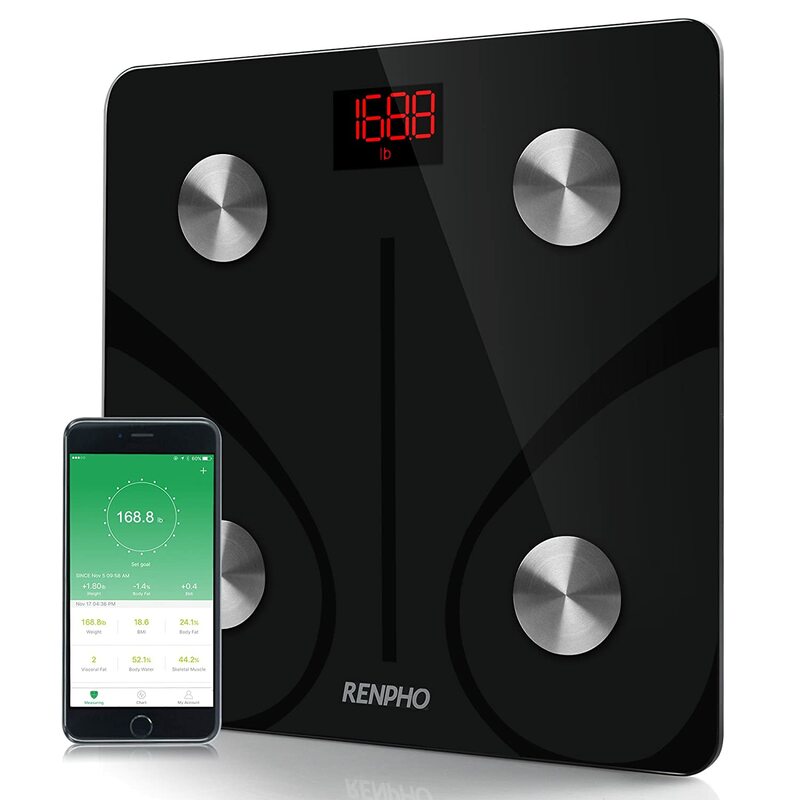 The Renpho Body Fat scale is sleek, modern, accurate and highly functional. 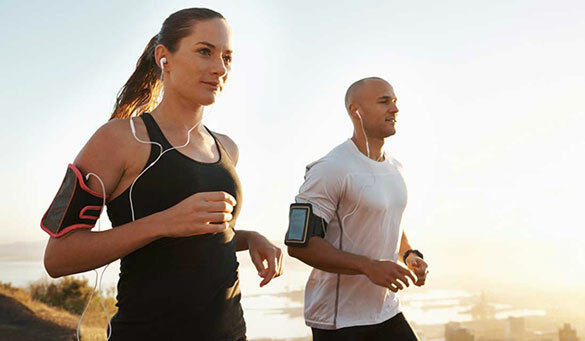 Its high-quality sensors and electrodes will give you fast and accurate readings on a number of different measurements, such as Body Weight, BMI, Body Fat%, Water %, Skeletal Muscle, Protein, Basal Metabolism, Body Age and more, to help you keep track of your health and whatever goals you are working towards. Best of all, the handy Renpho app, which is compatible with Android and Apple, makes keeping track of your weight as simple as it can be, and you can even share your progress with others. This digital scale can also sync with Apple Health, Google Fit, or Fitbit fitness apps if you prefer those. These BMI scales are very versatile and high-quality. The only bad thing we can say is that you’ll need a blue tooth device in order to get the most out of it. Manage your body weight measurements in style and ease with Balance’s amazing digital bathroom scales. This set uses some of the most advanced BIA technology available to give you precise measurements on body weight, fat, water, muscle mass and more. By using the free app (use with Android 4.3 & iOS 8.0 and above) you can conveniently calculate your health index with ease and monitor progress in weight loss or muscle gain. We really like these digital scales as they have a very user-friendly design, and the LED screen is very clear and easy to read. Also, you can get up to 5 months of power with 3 AAA batteries. 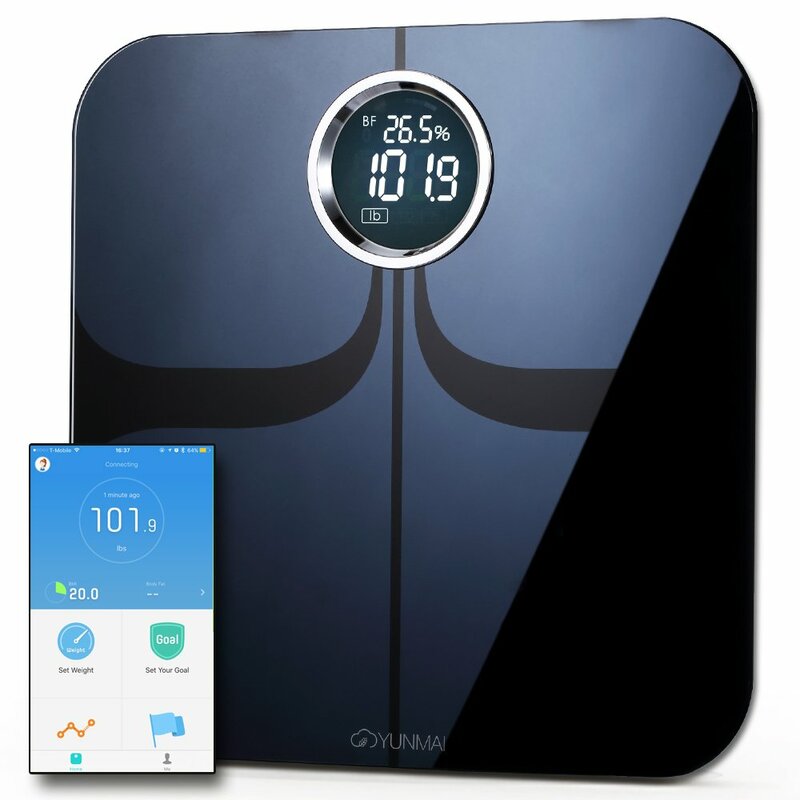 This Yunmai Body Fat Scale is one of the more expensive models on the market, but it comes with some serious horsepower to justify its steep price tag, it has YUNMAI Premium has a processing resolution of 16 Million, with a much higher precision than those of 12-bit conversion processing unit. What that basically means is that it can give you incredibly accurate readings. Like other scales of this kind, it comes with a free app that connects your real-time body metrics to a world of data charts, social sharing, and fitness tracking, and it can measure up to 10 different things from body fat to bone age. It is also very easy to set up – just pop your stats into the app and step on the scale. If you’ve got the cash to spare, this is one of the most impressive digital scales that measure body fat that we have seen. 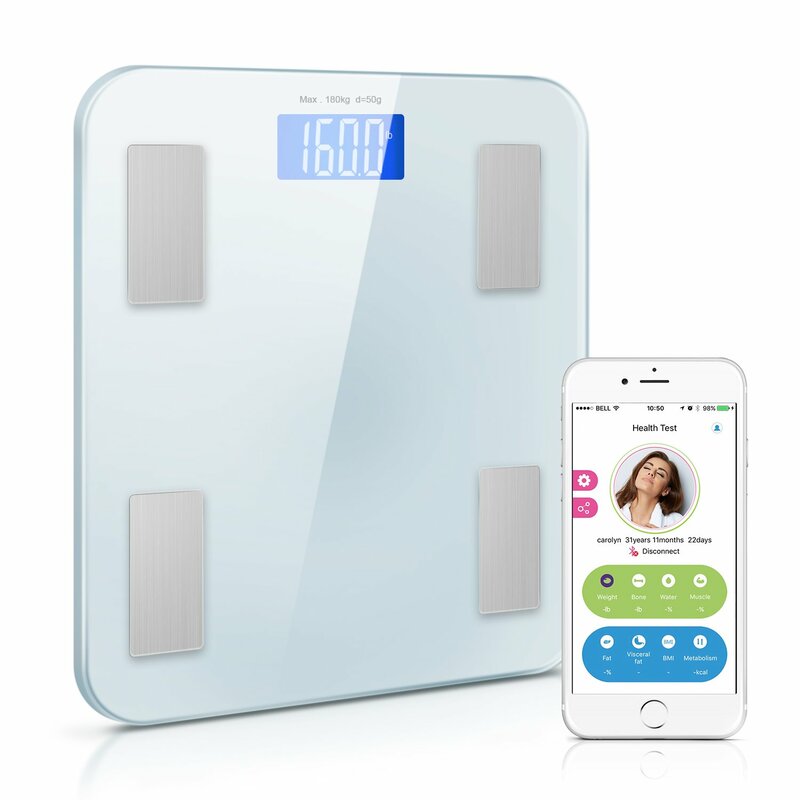 Equipped with 4 high precision sensors that can weigh from 11 pounds up to 400 pounds in 0.2 lbs increments, this smart scale give great readings for Body weight, Body fat, water, Muscle mass, BMI, BMR, Bone mass visceral fat, and it even comes with a handy baby weighing mode. It does indeed have an app, but it will also give you readings every time you jump on the bathroom scale, so you don’t have to bother with it if you don’t want to. This is a great budget option, and will be very useful for new parent with its baby weight features. 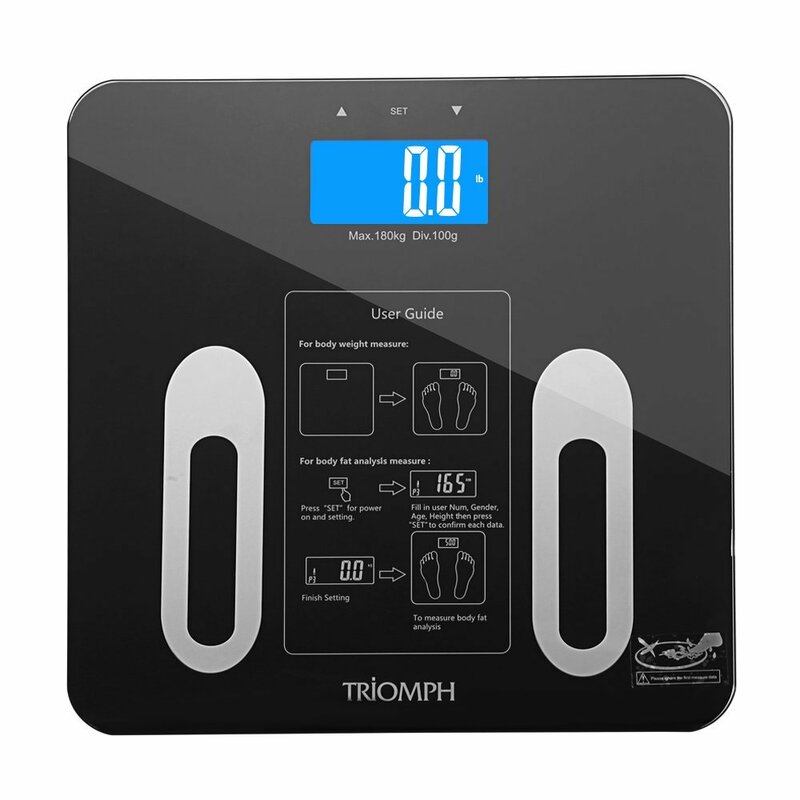 With 4 highly sensitive sensors, this digital scale can give readings to within 0.2 pounds on weights of up to 400 pounds. 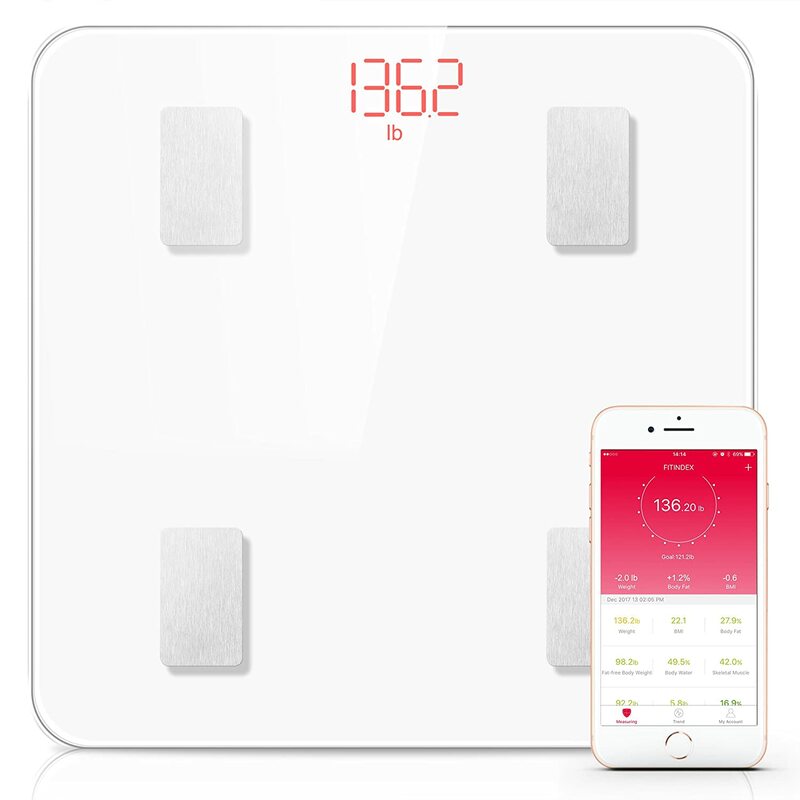 These bathroom scales can have profiles for up to 8 users , and it utilizes advanced algorithms to instantly calculate Body Weight, Body hydration, Body Fat, BMI, KCAL, Muscle Mass, Bone Mass and Visceral Fat. 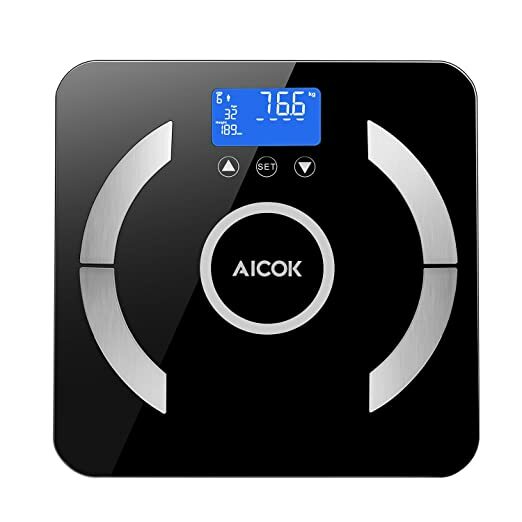 The Aicok scale is a great alternative to bluetooth scales, as this one will give you all the readings you need from its LED screen. Therefore, this is a great choice for those who don’t want to bother with an app. 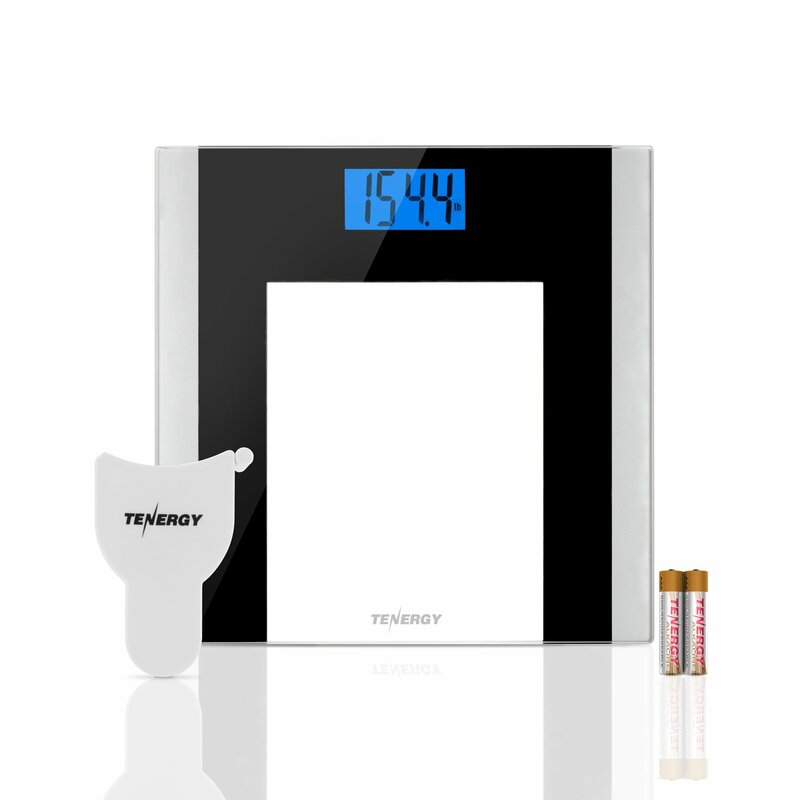 Tenergy make some of the best digital bathroom scales on the market, and we know that all of their products are vigorously tested to ensure that they are accurate and durable. This particular scale helps you stay on track with weight gain or weight loss journey as the highly accurate sensors to show readings with down to 0.2 lbs/0.1kg increments. There’s no need to fuss around with apps or downloads with the Tenergy BMI scales either. Just hop on the scale and track your readings that way. This also comes with a handy measuring tape included. For those with busy lives and no time to mess around, this awesome digital scale comes with no set up required. Just hop on the plate, and it gives you 8 essential readings automatically. The readings are then immediately sent via Bluetooth to your smartphone and can be read through the 1byone health app, which makings keeping track of your health and weight as easy as pie (pun intended). You don’t have to worry about fiddling around with Wifi settings or set up of any kind, just download the app, jump on the scale, and let the machine do the rest. This will be a great scale for those with hectic work schedules or busy parents who don’t have a lot of time to mess around. Just make sure your smart phone is compatible with the app. 11 pounds up to 400 pounds in 0.2 lbs increments. Requires “1byone wellness 2.0” from APP Store (For IOS) or Google Play (For Android). Another great solution for those who want detailed information about their weight and health but don’t want have time to mess around with settings or process huge amounts of information, the FITINDEX Scale auto calibrates as soon as you set o to it, and once you have downloaded their app to your smartphone, it will send you details on 11 detailed measurements including Body Fat, Water, Muscle Mass, BMI, BMR, Bone Mass, Protein, Skeletal Muscle and other data. This syncs to the app to make monitoring your health a breeze. This is a great scale for families, as it can accommodate unlimited users. So long as everyone in the household has a device that can use the app, each of them can hop up on the scale and get their personal readings synced to their smartphone and stay on top of weight loss, bulking up, or just maintaining good health. This stylish scale uses cutting-edge Bio Impedance Analysis (BIA) technology precisely measures weight, body fat,water, muscle, calorie, and bone mass percentages to help keep you and your family on top of your weight. Up to 10 users can store their readings inside the scale itself, which doesn’t use apps or anything like that – everything is kept within the scale, and its automatic recognition functions mean that it is simply a case of jumping on the scale, inputting which user it is, and getting he readings you need. As so many users can use this scale and it doesn’t require any apps or software to use, we recommend this for big families or for those who simply want to get weighed without having to worry about apps and downloads. We recommend the Rempho Body Fat Scales as our number one choice, as these scales are not only very durable and accurate, but they are very versatile and measure all kinds of things like Basal Metabolism and bone muscle, making it useful for all kinds of purposes. We also really like its app, and appreciate that it can be synced to other popular health apps like Google Fit. 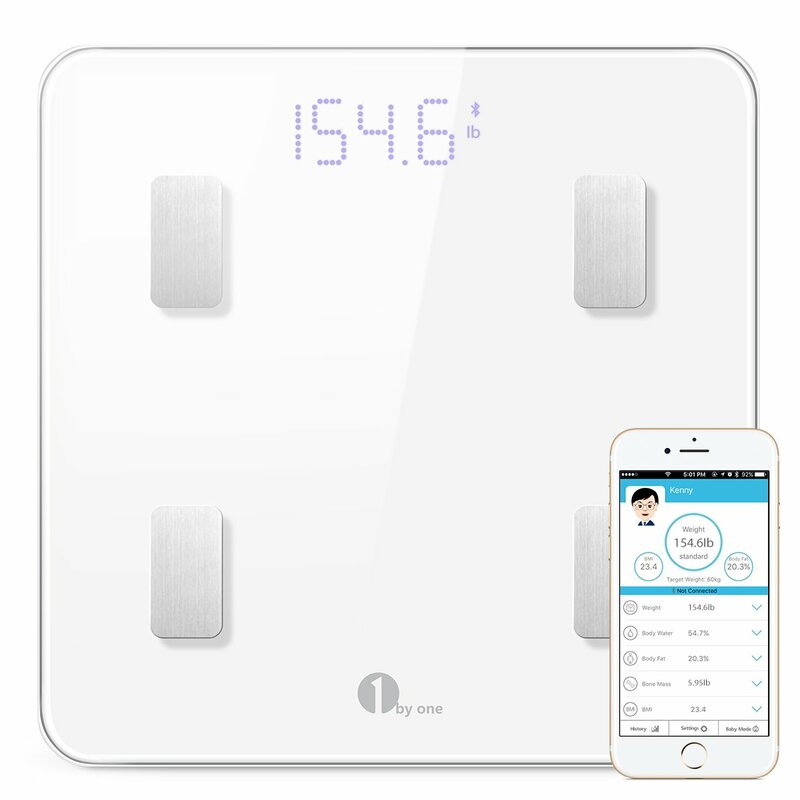 If you don’t have time to worry about apps and syncing and all you want is a nice Body Fat scale you can step on and off everyday, the Tenergy Body Weight Scale will be perfect for you and your family. It is a durable and sturdy little scale that will give you accurate weights without any of the distractions of more expensive models. Always keep the scales on a flat surface – this will give you the most accurate reading. If they are on a slope or uneven ground, it can often mess up the measurements as you may be leaning hard on one side. Stand Barefoot and in your underwear – Your shoes and your clothes add weight to you, especially if you wear heavy belts or a cellphone in your pocket. Leave them off so you can see how much you really weigh. Use on an empty stomach – Its best to hop on the scale first thing in the morning or at least to hours after a meal. The food in your stomach causes extra weight. Don’t use on wet or slippery floors – Its easy to get the floor wet when you come out of the shower, but you don’t want to weigh yourself on a wet surfaces for safety reasons. Don’t use it if you have medical implants or a pacemaker – Just about every scale we looked at warned against using them if you have medical implants or a pacemaker. We think its because the scales special sensors could possibly interfere with these. Whatever the reason, its not worth the risk. Please consult with your doctor for further info. Why Buy a Body Fat Monitor? You may be asking yourself why you need to bother with measuring your body fat. Isn’t is juts enough to weight yourself on a simple set of scales and be done with it? Well, the answer is, no, not if you are really interested about getting the most accurate and precise measurements of where your health is at. The basic reason is that not all of the pounds or stones you weigh are the same, and to really understand where your weight and health is at, you need a BMI monitor. As human beings, we are all incredibly unique at a biological level. We have different heights, bone density, muscle mass, and fat. There is so much that affects our weight, and there definitely isn’t a ‘one size fits all’ for a healthy weight. The problem with traditional scales is that they treat us all the same and only measure our overall weight. For example, a tall person and lean person with a lot of muscle might weigh around 200 pounds and be very healthy, whereas a shorter person with less bone density and muscle might weight around the same amount and be obese. The problem with the traditional scales is that they don’t distinguish between this. However, with body fat scales would get around this by calculating the excess body fat on each person, and then letting them both know how much they have and how healthy they are. Remember, obesity is not simply being overweight – it is having too much body fat regardless of your overall weight. Also, its good to remember that being overweight doesn’t always mean being fat. A girl who looks a bit plump might have a healthy BMI, while a skinnier girl may have more body fat depending on her frame, bone density etc, and thus may be at much more of a health risk. Again, a normal set of scales won’t ell you this, but BMI scales will. This can really make a big difference to you if you are trying to put on some muscle. Building up muscles involves a combination of both heavy strenuous exercise and an increased calorie intake, so body fat scales will help you keep on top of it and make sure that you aren’t putting on too many pounds of fat. They can also be great for body builders who are trying to lose weight but not lose muscle mass. For those who suffer from conditions like obesity, heart disease, diabetes and even some forms of cancer, monitoring body fat is very important, and with a set of these scales at home, you can track your BMI from the ease of your bathroom and keep your doctor updated with your readings. So they are also great for people with such health concerns and conditions. The simplest explanation for your BMI is that it is simply a measurement of your height and weight that calculates whether or not your weight is healthy. For adults, this is worked out by dividing your weight in kilograms by their height in metres squared. Therefore, it is a much more accurate way to measure your weight as it takes into account a number of different factors and is applicable to the many different shapes and sizes that human beings come in, rather than just measuring your weight, which can be deceiving as weight doesn’t take into account peoples height. Generally, for adults a health BMI is somewhere between 18.5 to 24.9 range. If you measure for any of the following BMIs, it is an indication that your weight is unhealthy and you should consult with a doctor. One thing you have to remember with BMI is that it doesn’t differentiate between muscle and fat. Muscle is much more dense than fat and weighs a lot more, so a heavily muscled person might be classed as overweight on the BMI, although in reality they are quite healthy. That is why BMI is just a part of the measurements that many of the awesome digital scales we recommend – they will also give you figures on other things like bone density, water retention, and so on, to give you a very precise view of your health. However, we cannot ignore that the Body Mass Index is a very valuable measurement to have in getting a good picture of your overall health. As you can guess, BMI is not accurate during pregnancy. If you’re looking onto body fat scales, there’s a good chance that you are interesting in how to lose weight. If that is the case, then don’t waste your time with weight loss pills, diet pills, scientifically unproven diets and whatever other ‘snake oil’ a greedy consumer industry might throw at you. While you really should see a doctor or a nutritionist for expert advice on your exact condition and lifestyle, we have some general weight loss tips and advice that can really go a long way towards helping you achieve your goals. The key thing to remember here is that there is sadly no easy fix or way to lose weight quickly that is healthy. You are going to have to make changes to the way you live your life, including how much you eat and how much exercise you do. Moderate Exercise – A big hurdle a lot of overweight people hit very early on in their weight loss process is that they exercise too much, putting huge strain on their muscles and heart, which leads to them feeling fatigued, depressed and discouraged. While many thing like Cross Fit are pushing the idea that ridiculous and extreme exercise is going to turn you into a super man or super woman, doctors recommend either short bursts of intense exercise, such as 10 minute intense work outs three times a week, or an hour of moderate exercise once a week. So ease into your exercise, keep it moderate, and remember, you’re not trying to be Captain America or Wonder Woman. As long as you are working up a sweat and doing it regularly, you’re on the right track. Consistency is they key. Also, find something you really enjoy. Not everyone is a dedicated gym bunny that can spend hours on the tread mill or weight room with their headphones blaring. If you’re a social person, try a team sport like soccer. Love the outdoors? Cycling or hiking might be for you? Interested in other cultures? Perhaps a martial art like Karate or Judo? Find something you like with a group of cool people. Also, while you don’t need to become the next Marvel superhero, weightlifting in moderate form is really good for weight loss, so make sure you include some of that in your routine of you can. Make A Diet Plan – Now, you don’t need to go overboard here and start living on only moss and rain water, but cutting out fatty processed food from your diet and reducing sugary and processed stuff like fizzy drinks, chocolate and cookies will go a long way for you. So make a nice diet plan, looking at what you are going to eat everyday. If you can, make sure you cook your own meals, and go on the internet to find some great recipes. A healthy diet doesn’t have to me masochistic, just load on the fruit and vegetables, use lean meat and fish and healthy carbs like sweet potatoes or brown rice. Fiber will also help your weight loss. We’d recommend fully cutting out soda or fizzy drinks, as these are just mountains of sugar in liquid form. Also, beware of ‘healthy’ snacks like muesli and granola bars, as these can sometimes have just as much sweeteners or sugar as chocolate. You still need protein for a healthy diet, so don’;t cut that out altogether, but maybe cut back on red meat. And don’t forget to have plenty of fresh fruit. You can use a meal planner app to help out with this. Healthier lifestyle habits – While diet and exercise are going to be the major components of weight loss, remember that you are a holistic individual, and that your health is linked to all elements of your life. So try to stay as healthy and happy as you can always. Go to bed at a good time and get enough sleep every night – remember, your body needs time to recharge from the new exercises you are doing. Get fresh air and enjoy the sunshine if you can. Do things that make you happy, see your friends, and try to have an active lifestyle. 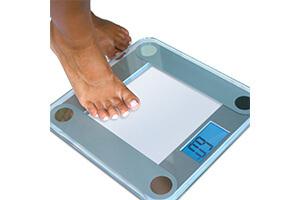 Don’t obsess over the scale – Did you know that your weight can easily fluctuate over 1.8 kg during the course of the day? a number of things, such as how much you’ve had to eat or drink, can cause these changes, so don’t stress out over the scales every single time. Look for long terms trends, such as the amount you have lost in a month. Weighing yourself everyday can sometimes make it seem like nothing is happening, and leading to discouragement and a feeling of failure. Remember to also think about how you feel and how you look as well. Are you looking happier? Are you feeling better? Don’t compare yourselves to others – We’ve all felt discouraged by seeing the slender and rip folk at the gym who seem to eat mountains and still maintain their perfect figures, but that’s fine for them. We only need to compare ourselves to ourselves, and the progress that we make is not to be measured against the progress other people make. Focus on you and your goals, making improvements wherever you can and always keeping consistent and positive. Also, don’t forget that the physics of Hollywood stars are a fallacy, and unless you have the time and money to train with pro althetes everyday, you’re never going to look like Gerald Butler in 300. and that’s fine, because even Gerald Butler himself doesn’t look like that anymore. One of the big concerns many people have when it comes to weight loss is that they don’t want to go overboard and start burning off their muscles as well as those extra pounds. This is a legitimate concern, and it happens more often than you think about it. Remember, your body basically works like a machine that needs to burn fuel. If their is nothing in the gas tank (your stomach) and nothing in the reserves (your excess fat), it needs to burn something else. The natural process, then, when there is no fat or carbs to burn, it break down health muscle tissue and use this for fuel instead. This is generally not a good thing, as we want to keep our healthy muscles not just so we look good on the beach, but we maintain our strength and vitality. So here are some tips to make sure that you axe the fat without throwing your guns out at the same time. This might be a no-brainer for many people, and asides, for some this might be all they can manage in one sitting. However, we must bear in mind that the body usually burns through a lot of its reserves in this amount of time, and if you keep pushing past this limit with nothing in your stomach, your body may feel that it is starving, kicking in the muscle devouring process. Another problem many people going in for weight loss fall into is that they try to cut out protein altogether. While fatty and deep fried proteins are indeed going to take up residence on your waist line, your body need protein in order to repair and strengthen the muscles that are stretched and changed as part of the natural process of exercising. Cut out too much protien and your body can’t do this, and the muscles can waste away. Keep up with the protein, but from healthy sources, such as lean chicken and turkey, tuna fish, beans and pulses.